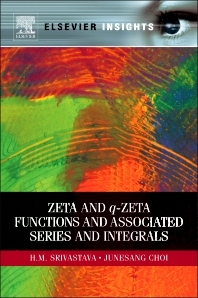 Zeta and q-Zeta Functions and Associated Series and Integrals is a thoroughly revised, enlarged and updated version of Series Associated with the Zeta and Related Functions. Many of the chapters and sections of the book have been significantly modified or rewritten, and a new chapter on the theory and applications of the basic (or q-) extensions of various special functions is included. This book will be invaluable because it covers not only detailed and systematic presentations of the theory and applications of the various methods and techniques used in dealing with many different classes of series and integrals associated with the Zeta and related functions, but stimulating historical accounts of a large number of problems and well-classified tables of series and integrals.